Concept: Through a simple-to-use app, Cargo42 provides companies an option to ship locally for a lower rate with trucks that have empty space in them. At the same time, carriers (local trucking companies) enjoy an additional revenue stream and maximize the trucks’ productivity. Story: The truck-sharing economy concept came from Francine Gervazio’s professional experience in the logistics and tech industries. She frequently saw trucks driving nearly or completely empty, and her company was paying the price for that empty space. Once Gervazio came to the United States in 2015, she confirmed this was not only a problem in her home country, Brazil, but a global issue. She decided to spin the opportunity into an actual business during her Babson College MBA program in 2015. That’s where she met Murilo Amaral and Alfredo Keri, who were essential pieces to make this happen. After having performed a pilot test in Boston, the Cargo42 team moved the operations to Miami last summer because of the big opportunities as a result of inefficiencies in this important U.S. logistics hub. The decision was also based on a competitive analysis and strategic positioning for future expansion and market growth, the founders said. “We knew already that Miami was a very big logistics hub, but we were really impressed when we saw the numbers and said, yea, that’s where we are going,” Gervazio said. 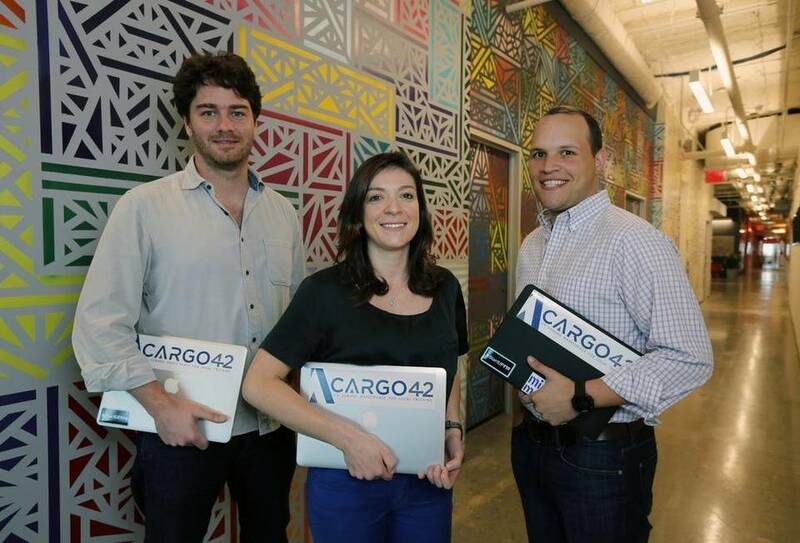 Before attending Babson for their MBA degrees, Cargo42’s co-founders had diverse experiences and backgrounds, including logistics, supply chain and operations as well as e-commerce and marketing and sales. Gervazio managed new operations for Easy Taxi, a Rocket Internet company, in Southeast Asia and Latin America, after working in logistics in Brazil and Australia. Amaral founded a packaging company with 250-plus employees, which acquired 6 percent of the Brazilian market share. Keri worked in sales and marketing for multinational companies, including British American Tobacco in Latin America. Last summer, the founders spent their summer going door to door in the South Florida territory to build their initial truck base. That was followed up with online marketing, cold calling and lots of networking at trade shows and industry events. Today, the company has 85 shipping companies and 380 carriers using the service. Its goal is to partner with a large company so it can expand much faster. Gervazio participated in the WIN Lab, Babson’s accelerator program for female founders, in Boston, and the whole team is part of StartUP FIU’s Cohort 2 now in progress.